Our Wembley Downs, Sorrento and Doubleview dentists provide teeth whitening in Perth’s western suburbs as an effective and minimally invasive way to improve the appearance of your smile. A stunning, megawatt smile can brighten any room and boost confidence. We’re delighted to help teeth whitening patients enhance their smile with Polar teeth whitening products, which are used by cosmetic dental clinics worldwide. 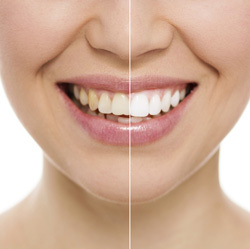 Why Choose a Professional Teeth Whitening Treatment? Depending on the type of results and the outcome you’re looking for, we offer both take- home kits as well as in-office bleaching. For value and predictable results, our custom whitening trays can be used at home. They fit snuggly over your teeth for optimal, even whitening results. To combat sensitivity, we also recommend using calcium-based Toothmousse during your home whitening treatments. Take-home tooth whitening kits allow you to conveniently top up your whitening throughout the year. Refill syringes of bleaching gel are available for purchase at any one of our locations in Doubleview, Sorrento and Wembley Downs. Looking for a way to quick-start your whitening results or don’t have time to wait on take-home trays? Ask about our one-hour in-chair treatment. Combined with our take-home option, this method of whitening creates dramatic results. You will need to have a dental exam prior to starting a whitening routine to ensure that your teeth are free of decay, disease or aging fillings. It is also important that your teeth have recently been cleaned by one of our hygienists. Our dentists will discuss which type of teeth whitening treatment in Perth is most appropriate for your individual needs so that you can start straightaway. Contact Dental Link today to begin!